U.S. Navy photo by Mass Communication Specialist 2nd Class Ronald Gutridge. Washington – Connecticut is certain to benefit from the Navy’s plans to step up submarine production, but there are fiscal hurdles and other challenges to overcome before the state can count on that ramped up production. Navy officials testifying in front of Congress last week on the Pentagon’s proposed $750 billion budget were keen on buying three Virginia-class submarines next fiscal year, instead of the traditional two-a-year it has asked lawmakers to fund. “It’s very clear there’s a commitment to three subs,” said Sen. Richard Blumenthal, D-Conn., a member of the Senate Armed Services Committee. The Pentagon has asked for $10.2 billion to allow Electric Boat, and its partner Newport News Shipbuilding, to build three fast attack Virginia-class submarines next year. That’s a significant increase over the less than $6 billion that has been traditionally appropriated each year for the Virginia-class program because each sub will cost $3.2 billion apiece, up from $2.7 billion for the older boats. The new subs will cost more because they will be larger and modified to include the “Virginia Payload Modules,” which will be placed on most Virginia-class boats built in 2020 and beyond. Those modules increase the number of missiles each sub is able to launch. But even if Congress agrees to the $10.2 billion for the Virginia-class program next year, that money won’t be spent right away. Under the Pentagon’s plan, that third sub won’t be built until 2023. That’s because the shipyards are now gearing up to build another type of submarine, the huge, 560 foot-long ballistic missile Columbia-class. Construction of the first Columbia-class is scheduled to begin in 2021 at a cost of at least $6 billion. At a Senate Armed Services Committee hearing last week, Sen. Mazie Hirono, D-Hawaii, said she was “mystified” as to why the Navy was asking for money for a third sub in its 2020 budget, but would not build that sub until 2023. Geurts also said the third submarine would be purchased outside the contract for the next block of 10 Virginia-class subs that the Navy is negotiating with Electric Boat, negotiations that have dragged on longer than expected. Rep. Joe Courtney, D-2nd District, who represents a district that’s home to both Electric Boat and Naval Submarine Base New London, said EB had “planned to lay a few people off” as production dropped off between the construction of the first Columbia-class sub in 2021 and the second boat in 2024. “The third Virginia-class sub will smooth out the employment levels,” said Courtney, the head of the House Armed Services seapower subcommittee. The Navy decided to add a third sub to its 2020 budget because it says it is falling behind against growing Chinese and Russian fleets. The U.S. submarine fleet right now numbers 51 boats. But with the retirements of older Los Angeles-class subs, the fleet will be at 42 subs in the year 2026. Meanwhile, the Navy has determined it needs 66 subs to ward off all threats. “Even with a third submarine in 2020 — it is still going to be the furthest away from its validated requirement for the next 20 years,” Bill Merz, deputy chief of naval operations, told Courtney’s panel at a recent hearing. Merz also said that despite backlogs at shipyards and bottlenecks with the supplier base, the Navy needs to ramp up its construction of submarines. “We have been fighting very hard to get that [Virginia] program back on track, and no matter what we do — even with a third submarine in 2020 — it is still going to be the furthest away from its validated requirement for the next 20 years,” he said. At the same hearing, Geurts said the build time for Virginia-class subs has been cut from 84 months to 66, but “we’ve been a little bit challenged” on pushing that number any lower. While the Navy has made submarine construction a priority in the nation’s defense, the overall size of the Pentagon’s budget poses a problem in Congress. President Donald Trump is seeking a $750 billion national defense budget for fiscal 2020, a sizable increase over the $716 billion Congress enacted for this year. To get around congressional budget caps, the Defense Department’s budget request includes boosting the Pentagon’s war fund, which is not constrained by budget caps, to spend on weapons programs like the construction of submarines. House Budget Committee Chairman John Yarmuth, D-Ky., on Wednesday called the plan a “patently dishonest budget maneuver” to avoid statutory budget caps. Yarmouth also said increasing the Pentagon’s budget through the war fund could result in another partisan stalemate and government shutdown. At the Senate Armed Services committee hearing last week, Hirono said, “I do not support such a gimmick. One thing Courtney said is likely to be “on the cutting room floor” when Congress finishes work on the defense budget is the $7 billion requested to fund construction of Trump’s controversial border wall between the United States and Mexico. 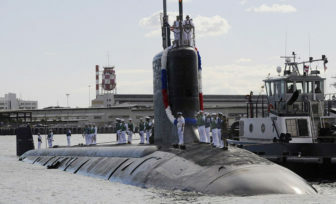 On Monday, Courtney, every other member of Connecticut’s House delegation, and dozens of other lawmakers signed a letter to the Democratic and Republican heads of the House Appropriations Committee to fully fund the third Virginia-class sub. “The Virginia-class sub remains one of the most effective and sought after tools in the nation’s arsenal,” the lawmakers wrote. Loren Thompson, a defense analyst at the Lexington Institute, said he’s confident money for the third sub will survive congressional cuts to the Pentagon’s budget. The amount raised by the delegation is less than the amount the lawmakers raised during the same period two years ago.